Some of the style decisions are unusual. In ordinary English, most people are used to spelling the word "advisor" with an o, but AP style requires that it be spelled with an e, as in "adviser." Another rule states that you shouldn't call something the "First Annual" whatever, because if it's the first year, it can't be annual yet. Only after it has in fact become an annual event can it be called that. Actually, that makes good sense. The first of anything has a special position, so that in many cases it becomes the one, rather than just the first one. Thus, for example, there might be nearly countless parents in the world, but for those of us fortunate to remember our parents, there is only one pair that is the first. . .and only. The stars, too, are almost countless, and yet there is one among them that is so important to us that it took a while before we could see it for what it was: another star that our Earth happens to orbit. That star is, of course, the Sun. Not everyone considered the Sun to be a deity, though. As I described in "Music of the Ellipses," many ancient Greeks considered the Sun to be simply one of the seven planets, since it moves across the celestial sphere. Thus, the Moon was also considered one of the planets, initially; in fact, it was probably the first celestial body to be identified as such. Anyone even casually following the Moon from night to night will observe that it moves among the fixed stars, and this motion defines it as a planet. After the Moon, the planets Mars, Jupiter, and Saturn are probably tied for second, in terms of how obvious their motion is. The Moon goes once around its orbit, a circle of 360 degrees, in about 27.3 days, so on average, it advances about 360 divided by 27.3 or 13 degrees per day. In comparison, Mars when it is visible moves no faster than perhaps 3/4 of a degree per day, and Jupiter and Saturn move even more slowly than that. All the same, their motion over a week or so must have been easily detectable to anyone paying careful attention to the sky. Contrast this with the Sun. The Earth goes once around the Sun in one year; from the point of view of a fixed Earth, the Sun appears to go once around the Earth in a single year. That means that each day, it advances a little less than 1 degree, on average. It therefore appears to move faster than Mars, Jupiter, or Saturn. Even so, the Sun's daily motion is not obvious, and it's not hard to see why: the Sun is so blindingly bright that it's quite impossible to see any of the stellar background whenever the Sun is up in the sky. As the Sun begins to set, the stars begin to come out, but by the time enough stars are up to track the Sun's progress, the Sun has already left the sky and its position with respect to the stars can't easily be accurately picked out. As a result, there's no way to directly identify the Sun's motion. The only way early humans could have figured it out was to observe how the Sun's glare blocked out an ever-changing array of constellations. In March, for example, the constellation of Aries the Ram can't be seen, because the Sun is among (that is, in front of) the stars of that constellation. Meanwhile, the constellation of Virgo is high in the sky at midnight. Half a year later, in September, it's Aries that hangs high in the sky at midnight, while Virgo is lost in the Sun's glare. In this way, the Babylonians first identified the Sun as one of the planets, but it was the Greeks who first tried to come up with theories of how the Sun moved. At first glance, this seems like it's a simple matter, provided you assume that the Earth is at the center of the universe and the Sun revolves around it. However, around 570 B.C., the early Greek scientist Anaximander of Miletus (611-547 B.C.) discovered something interesting about the Sun's motion. The Sun follows a path on the celestial sphere, called the ecliptic. Because the ecliptic is not aligned with the Earth's rotation, but is instead tilted (by an amount equal to the Earth's tilt, 23.4 degrees), the Sun is sometimes further north in the sky, and sometimes further south. When the Sun is to the north, the northern hemisphere experiences spring and summer, and the southern hemisphere experiences fall and winter. The situation is reversed when the Sun is to the south. The seasons are therefore determined by when the Sun, in its path along the ecliptic, crosses the celestial equator, which is the projection of the Earth's equator up to the celestial sphere. When the Sun crosses the equator on its way northward, spring starts in the northern hemisphere; when it reaches its northernmost point, summer starts; and so forth. Anaximander discovered that he could determine just when the seasons started by means of a simple experiment. He inserted a stick into the ground, and he traced the tip of the shadow cast by the stick throughout the day. If the path of the shadow was further south than it was on any other day, the Sun was then at its northernmost point, and it was the start of summer in the northern hemisphere. If, on the other hand, the path of the shadow was further north than on any other day, it was then the start of winter in the northern hemisphere. And if the path of the shadow extended perfectly west to east, the Sun was on the equator and it was the beginning of either spring or fall. The Sun's positions at the start of the four seasons are equally spaced on the celestial sphere, and it might seem that the seasons would therefore last equally long. But when Anaximander did his experiment, he found that the seasons were not equally long. Instead, spring and summer were noticeably longer than winter and fall, in the northern hemisphere (where Anaximander lived). Evidently, in its path across the celestial sphere, the Sun did not move at the same speed at all times. It must move slower during spring and summer, which last longer, and faster during fall and winter, which are shorter. No quantitatively satisfactory explanation was offered until the late Greek astronomer, Ptolemy (c. 85-165). Throughout classical times, Greek philosophers felt that the only motion suitable for celestial bodies was uniform circular motion. Ptolemy's solution managed to retain a circular orbit, as well as a certain uniformity to its motion. When the Sun was in the portion of its orbit when it was closer to the equant, it couldn't move at the same speed as it did in the other part, because from the equant's closer perspective, it would appear to move faster. It had to slow down to make it appear, from the equant, that it was moving at the same speed. This was when spring and summer took place. Conversely, when the Sun was further away from the equant, it had to move faster in order just to appear to keep pace; that was fall and winter. Ptolemy's theory allowed him to construct tables of the Sun's position that matched the best observations available in his time, and for a millennium thereafter. Not until Kepler's time (see, again, "Music of the Ellipses") did the true motion emerge: it's the Earth that revolves around the Sun, and not the other way around. What's more, the Earth's orbit is not a circle, but an ellipse, with the Sun at one focus. Even so, Ptolemy's theory would work pretty well, if one switched the Sun and the Earth. The Earth's orbit is an ellipse, but one that is not especially distinguishable from a circle. Its eccentricity is 0.0167, which means that its major axis (its "length") is longer than its minor axis (its "width") by less than 1 part in 7,000. And Kepler's laws of planetary motion can be used to show that the Earth's motion does appear very nearly uniform when viewed, not from the Sun, but from the other focus -- the empty one. It is that empty focus that corresponds to Ptolemy's equant. It is well that Kepler derived his laws from observing Mars, which has an eccentricity of about 0.09. Mars's orbit just barely did permit him to identify the correct laws of motion. If Mars had an orbit like the Earth's, Kepler would have concluded that Ptolemy's theory -- properly adapted to the heliocentric theory -- was perfectly sufficient to explain the motion of the planets. But most of the ancient Greeks held that the Sun was just a container of heavenly light, which meant that it was massless and therefore couldn't be expected to sit at the center of the universe. Then, in 1610, Galileo Galilei (1564-1642) turned his telescope to the Sun, and discovered sunspots. He was quickly followed by several other astronomers of the time. Sunspots had certainly been seen before then, although they were often misinterpreted. For example, just three years earlier, Kepler had observed the Sun using a pinhole camera, and noted a dark spot apparently crossing the face of the Sun. He interpreted this spot as Mercury, whose orbit is interior to the Earth's, and therefore occasionally passes between us and the Sun. However, by computing the positions of the planets back in time, we know now that Mercury was not transiting the Sun at the time Kepler was observing, and what he really saw was a sunspot. Actually, Kepler himself could have figured it out had he only kept observing the Sun. Mercury travels so fast in its orbit that it takes only a few hours to cross the face of the Sun as seen from the Earth. But a sunspot, moving along with the "surface" of the Sun, takes about a month to go once around the Sun, so it can be seen continuously (during the daytime, at least) for a couple of weeks, which Galileo observed. What's more, not all sunspots take the same time to go around the Sun. Those near the Sun's equator take about 25 days to go around, but those nearer the poles take longer -- closer to 29 days. In fact, if there were sunspots very near the pole -- which there never are -- they would take about 33 days to make their very small circle around the Sun's axis. The Sun evidently doesn't rotate all in one piece, and can't be a solid, rigid body. The portion of the Sun near its equator rotates faster, meaning that there is a shearing motion to the Sun's rotation. It is thought that the magnetic field of the Sun, which would otherwise come out in neat closed loops like that of the Earth, gets twisted this way and that by the differential rotation of the Sun, and one of the visual effects of this magnetic shearing are the sunspots themselves. Some other stars have also been observed to have sunspots (maybe they should be called starspots?). These aren't observed visually, but are rather detected when their brightness, as measured by very delicate instruments, drops when the spots face us and then rises as the spots rotate away from us. This is another piece of evidence that the Sun is just another star that happens to be very close to us. Actually, that was assumed by many scientists long before it was well established. The Dutch astronomer Christiaan Huygens (1629-1695) compared the light of Sirius and that of the Sun and, on the assumption that they were equally bright, determined Sirius to be about half a light-year away. Later, Isaac Newton (1642-1727) used a similar method and decided that Sirius was about 16 light-years away. The correct answer is just about halfway in between -- 8.6 light-years -- but of the two, Huygens is probably more nearly correct. Sirius is intrinsically brighter than the Sun, so it appears brighter than the Sun would if it were at the same distance. Had Huygens known that Sirius was that much brighter, he would have arrived at a distance of about nearly 5 light-years -- a pretty fair estimate for the 17th century. At its true distance, of course, the Sun is stunning -- dangerously so. It is the brightest thing in the sky by far, about 400,000 times brighter than the full Moon. It's more than just a quantitative difference; it's not merely that the Sun is extraordinarily bright. It is so bright that its radiation can burn your retina, damaging your eye permanently. It takes a certain amount of time (a short time) to do this, of course. Otherwise, our eyes could never have adapted to work during the daytime, because whatever we do, there will be times when the Sun just happens to be in our eye somewhere. The key is that the eye is constantly shifting directions. Not only does this permit us to take in the whole view (our eye is really only sensitive to detail in its very center -- try to read the next paragraph without moving your eye at all), but it also keeps the Sun's light from focusing on any one portion of the retina for an extended period of time. If you were to stare at the Sun for any length of time, the Sun's heat would build up in a small region of the retina, damaging the receptors there and leaving a blind spot in your vision. It's even worse with a telescope. Not because the light is more intense, in the sense that more energetic light is hitting any particular receptor on your retina -- no optical telescope can do that -- but because the image of the Sun is magnified by the telescope, and the same intensity of light is hitting a huge portion of the retina. Under ordinary circumstances, without optical aid, the Sun's image is constantly moving around your retina, and a section that's heated by the Sun one moment, isn't the next moment, and it can dissipate the accumulated heat to its surroundings relatively quickly. But with a large portion of the retina being heated by the magnified Sun, the eye can't escape the Sun's image fast enough. No portion of the retina can dissipate its accumulated heat, because its surroundings are all also being heated by the Sun. As a result, your retina can be burned out with disheartening and tragic speed. To observe the Sun safely, some other means must be found. One early method was the one Kepler used to almost discover sunspots: a pinhole camera. This is simply a box with a pinhole on one end, and a screen on the other. Light from the Sun (or any other brightly illuminated object) passes through the pinhole, and forms an inverted image on the screen. The pinhole admits very little of the Sun's light, and what light does pass through isn't passing directly into your eye but is instead shining onto a screen. So the pinhole camera is a safe way to observe the Sun. For this reason, it's often been suggested to amateur observers, possibly also because it's clearly inexpensive. What this means is that the Sun's image on the screen will be correspondingly small -- about a half degree wide as seen from the point of view of the pinhole. For a pinhole camera 4 meters in length (a very long box indeed! ), the image of the Sun would be a mere 3.5 centimeters across. Something similar can be done using a small, inexpensive refracting telescope -- the kind that uses only lenses. If the telescope is pointed toward the Sun (carefully), the telescope will project an enlarged image of the Sun out the eyepiece. Obviously, we can't put our eye there, so a screen, such as a piece of paper, is used instead. The screen captures the enlarged image, which can then be observed in safety. This method can still be slightly dangerous, since some care must be taken in pointing the telescope toward the Sun without looking at the Sun (this is harder than it sounds), and also in setting up the screen without burning one's hands. For individual viewing, one attractive alternative is to use a solar filter that fits over the top of the telescope. The kind that fits into the eyepiece is dangerous, for light focused by the telescope's main optics can burn the filter just as well as it can burn your retina, and if the filter breaks, so will your eye. There is little or no warning. A filter over the main optics attenuates the light by a factor of about 100,000 (and completely eliminates ultraviolet and infrared light) before it enters the telescope, protecting not only your eye but your telescope. (The projection method can damage reflecting or compound telescopes.) These filters aren't terribly expensive; a pre-made filter can be bought for most telescopes for well under $100 US, and filtering material can be bought to make your own filters for less than $25 US. Each of these methods suffices to view sunspots and perhaps a few faculae: thin, winding lines of slightly brighter light, extending for perhaps a quarter to a half the width of the Sun. To see other features, such as prominences and flares, a special kind of equipment called a hydrogen-alpha filter is needed. Because of its magnetic field, the Sun occasionally throws out an arc of its material -- these loops of mostly hydrogen gas can extend for over a million km. The Sun's light is so bright that it overwhelms these tenuous prominences. An ordinary filter must filter out so much light that the weak prominences are all but eliminated. 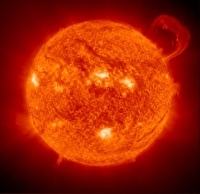 Fortunately, however, since they are composed of hot hydrogen, the prominences emit a substantial amount of hydrogen-alpha light, a particular wavelength of light at 656.3 nanometers produced when the hydrogen atom's electron changes from one energy level to a lower one. The Sun's disc, although it is much brighter than the prominence, is essentially a black body radiator (see "The Color Green" for more on this), so if one can filter out all light except for the small range around the hydrogen-alpha wavelength, the Sun's disc can be dimmed substantially while leaving the prominence comparatively untouched. Such filters are expensive, typically starting from about $1,500 US, but the views are astonishing. One last point. We ordinarily imagine the Sun to be quite yellow, but as a matter of fact, it is almost flat white, with at best a pale yellow cast. Why then do we think of it as yellow? Three reasons come to my mind. First, the atmosphere scatters away much of the blue light from the Sun, so what comes through unscattered is yellower than the Sun as measured by instruments in outer space. Secondly, with all of that blue sky around it, our eyes tend to perceive the Sun as being of the complementary color -- that is, yellow. But the most important reason, in my opinion, is that we have been taught by popular culture for years that the Sun is yellow, so that's what we expect to see, and what we end up seeing. There really doesn't have to be any reason more complicated than that. Adapted from Astronomical Games, June 2003. Brian Tung is a computer scientist by day and avid amateur astronomer by night. He is an active member of the Los Angeles Astronomical Society and runs his own astronomy website. His previous publications in Strange Horizons can be found in our Archive. To contact him, email brian@isi.edu.